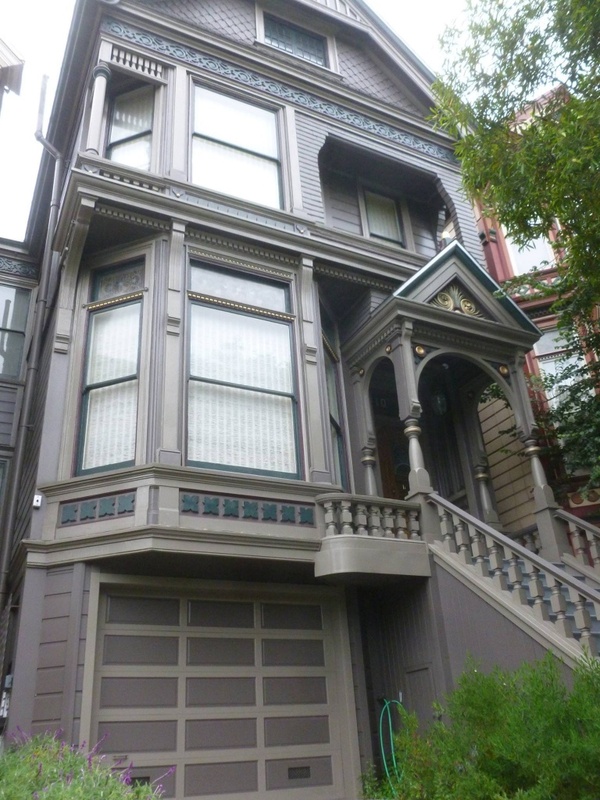 But fifty years earlier, in 1967, something special was afoot in San Francisco. 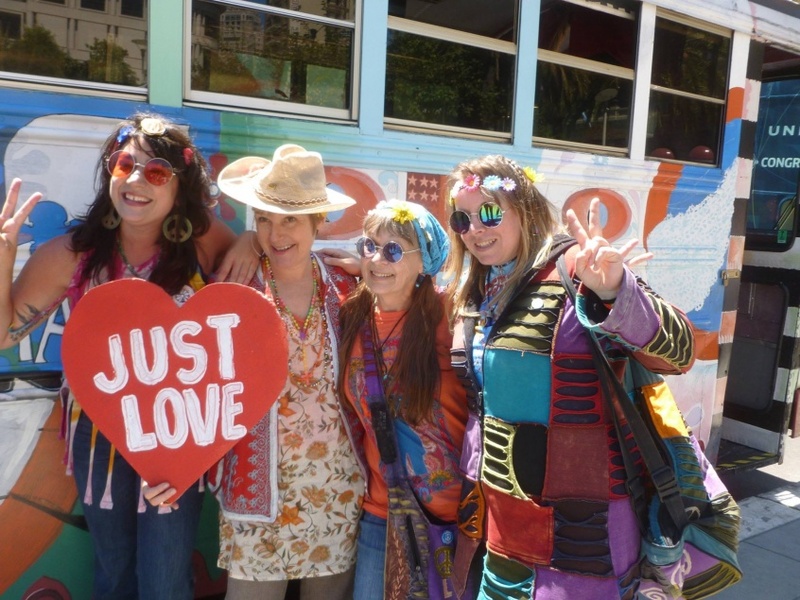 CJNU’s Christie Dawn took a trip to San Francisco earlier this summer, to see what remains of the Summer of Love, half a century on. Tune in to CJNU on Friday September 15th at 7pm, to hear a special show which revisits the music of 1967. Click below to Listen Again! CELEBRATING THE SUMMER OF LOVE! All aboard the Magic Bus! You’re about to embark on a trip back in time! Join us as we travel all the way back to 1967 to celebrate the Summer of Love! And I’m sure you’ll agree that there’s no better place to do just that than in the land of peace, love and groovy tunes – San Francisco! So, get those flowers in your hair and get on the bus! I guess it was fairly early in the year when I realized that this summer of 2017 would mark the 50th anniversary of the Summer of Love. The thought to quickly follow was “what better time to visit San Francisco!” A call to my hippie-hearted mom to share the suggestion and my enthusiasm sowed the seed. A few short months later, on July 22, we loaded up the car and started on an adventure like neither of us had ever had before! We’ll flash forward past the days of driving, although many adventures were had on the road as well, and skip to the heart of the story. We arrived in San Francisco on July 26, tired from the trek… overwhelmed, excited… and somewhat in disbelief that we had actually arrived! We were here! In San Francisco! Well, let’s get on with the Summer of Love celebrations then! 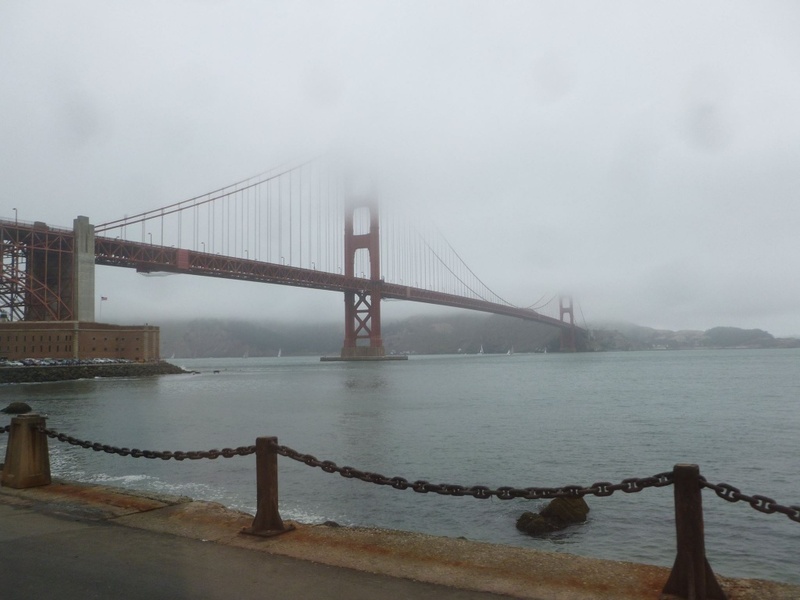 The Golden Gate Bridge, amidst the fog… no, not THAT kind of fog! Now, our recollections of the 50th anniversary will clearly be less “foggy” than those who were there in ’67… and thankfully, otherwise we not have much of a story to tell! I’ll start with the beautiful, magical garden we stayed at for the duration of our stay. We found ourselves at a VERY cool airbnb location – with plants and flowers of all kinds, water contraptions, multiple levels of magic garden to explore, musical instruments, and a stunning view of the city below from atop Bernal Heights. The perfect place to retreat to each day. I’d urge you to look up Jeannie and Skate Stone, our fabulous hosts, if you need accommodations should you ever decide to head to SF yourself! 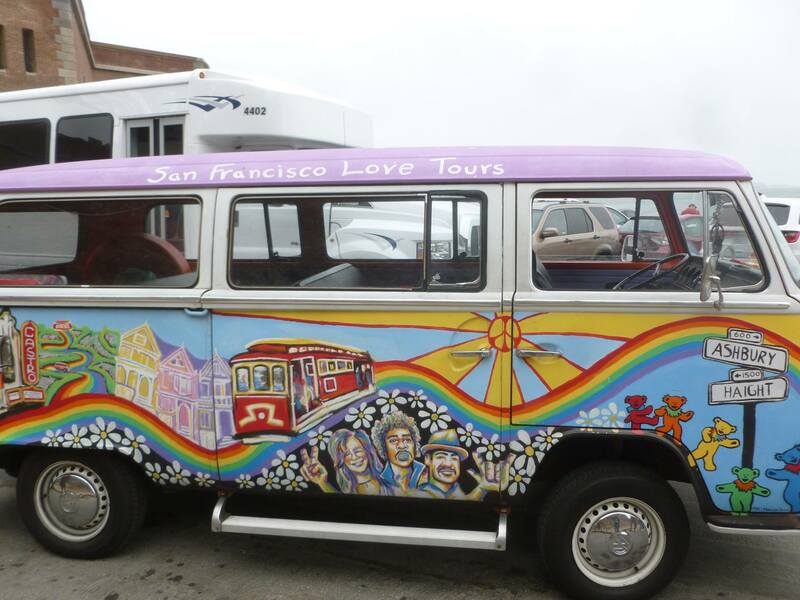 Our first excursion would be the San Francisco Love Tour. 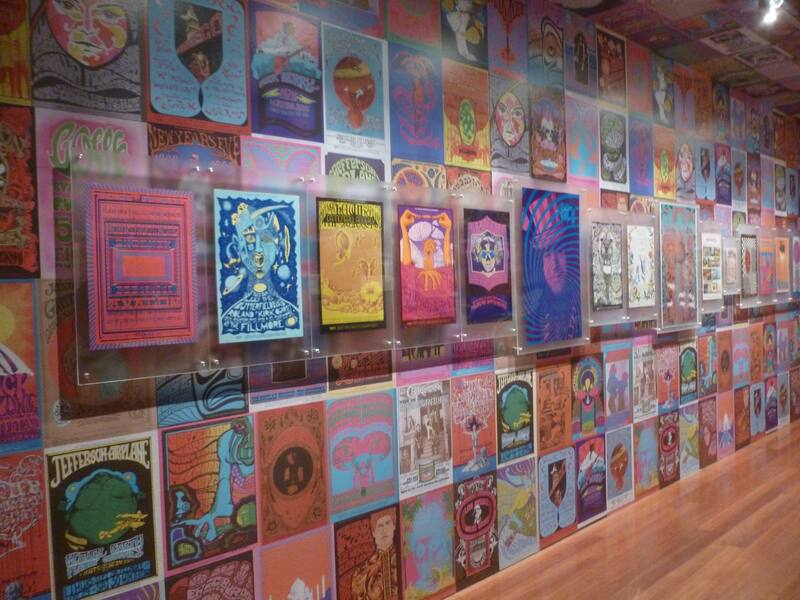 Next on our Summer of Love celebratory excursions- The Summer of Love Experience at de Young Museum in Golden Gate Park. As we strolled up to the museum, we were greeted with messages of love and peace adorning the walkways. “THE LOVE GENERATION IS EVERYONE”, “BE NICE TO EACH OTHER”, “I CHOOSE PEACE”, and many more. Inside, we wafted from room to room gazing at outrageously groovy get-ups and taking in all the music and history of the times, stopping for a break and some pictures atop the shag bean bag chairs in the psychedelic room. Oh, to be in those times! Though my mom was in those times, I could only imagine. But between the tours and exhibits and the whole scene and vibe here in San Francisco, my imagination was helped along quite nicely! After the museum, we headed for Haight Ashbury, with great anticipation. (We had passed through on the Love Tour but now we were walking and had a whole day to explore the area.) Excitement was bubbling over as we approached the famous corner. Wow! 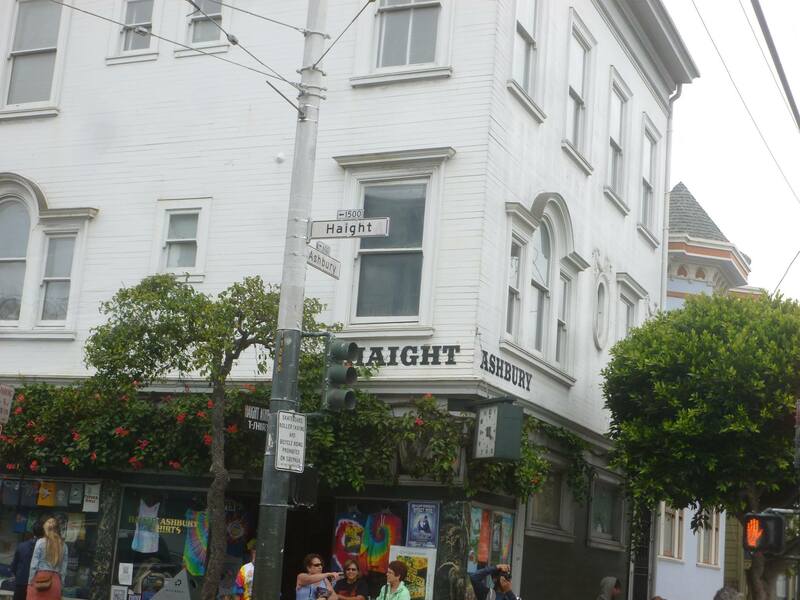 We’re at the corner of Haight & Ashbury, man!! We spent the day checking out the many shops in the area. 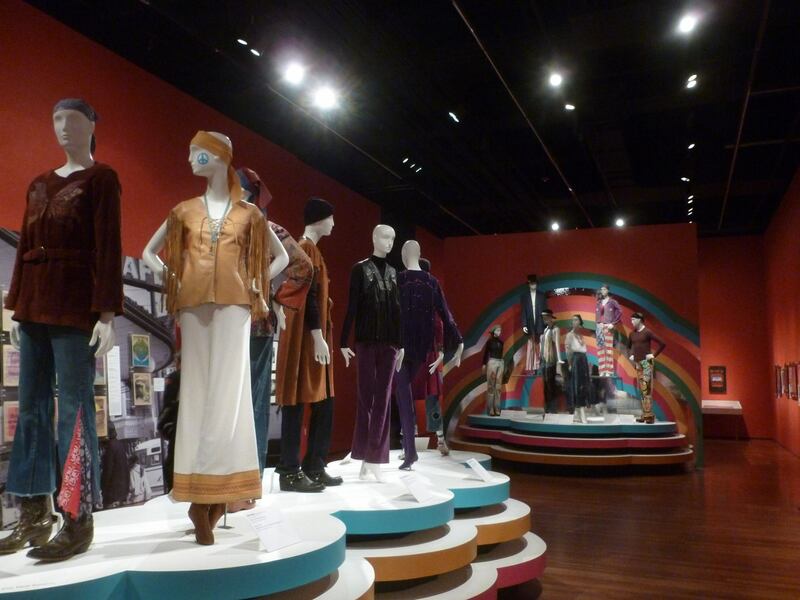 So colourful and bold and…far out! Major sensory overload and we loved it. We even enjoyed some Purple Haze pizza across the street from where Jimi Hendrix use to crash. What a day! Were you wearing any of these fashions at the time? Are you still wearing any of them now? Recognise this house? The Grateful Dead certainly do…! Our next 60’s inspired outing would see us onto what would be one of the main highlights of our trip- the Magic Bus. We awaited our ride across the street from Macy’s in Union Square. Up comes a funky, bubble-blowing bus and out of it appears a fun-loving ray of sunshine to accompany us on what was to be one of my most memorable experiences EVER. We walk up the steps onto the Magic Bus. There are disco balls and lights and a red velvet curtain behind our delightful driver, Ju-Ju. Let the magic begin. Gaia (our fun-loving ray of sunshine guide), adorned in flowers and peace signs gets us right into the spirit of the 60’s, singing songs of the era with us, flashing peace signs freely and yelling I love you’s out the window as we rolldown the road. Points of interest are shown and explained as we look out the windows and then “windows up!” Screens roll down with images from the 60’s, psychedelic light shows, and even a simulated trip to the moon! 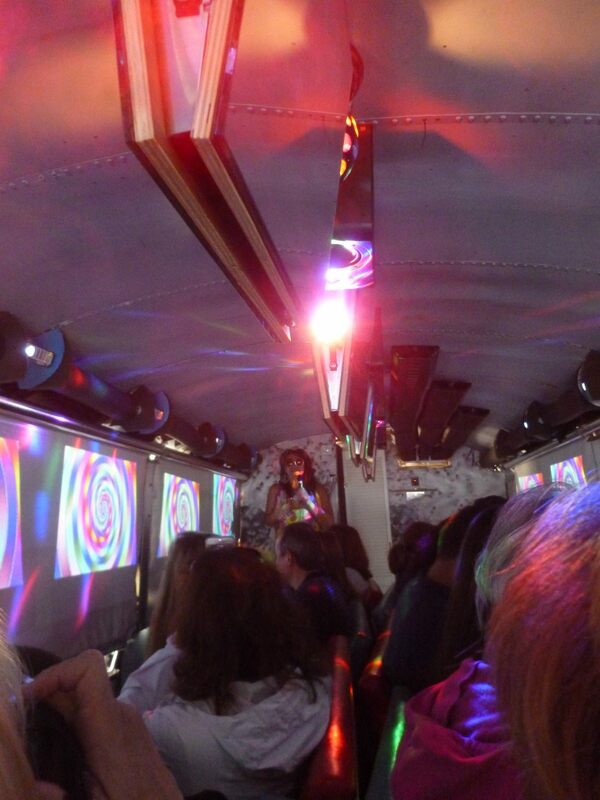 I could write an entire story just on the Magic Bus, and it still couldn’t convey the experience adequately. Far out! The Magic Bus projected images of the past, as you drive past the places in the present! 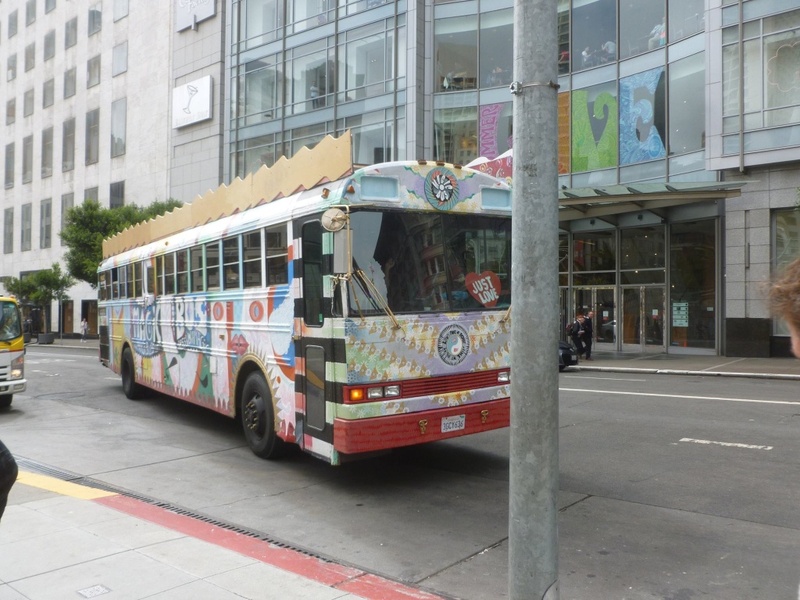 So, should you find yourself in San Francisco, be sure to (wear some flowers in your hair) and ride the Magic Bus! (magicbussf.com) After all, you’re either ON the bus, or OFF the bus! Christie Dawn is CJNU’s Creative and Production Coordinator. In addition to working in the office, she also often co-hosts and produces programmes on the station. If you missed the Summer of Love Special on Friday September 15th 2017, it will be available to listen again on this page shortly!